Everyone knows the red carpet is all about the gowns. So which actresses made the best (or worst!) dressed list in search? Zoe Saldana's purple Givenchy haute couture gown won the day in searches, with just a few more queries than runner up Miley Cyrus, who walked down the carpet in one of Jenny Packham's finest. Both beat searches for Sandra Bullock's dress (Marchesa) by large margins. Sarah Jessica Parker, always the fashionista, ranked a distant fourth in Chanel. Certain designers were also popular in search, thanks to the stars who wore (and name-dropped) them. Elie Saab (worn by Anna Kendrick), Armani Prive (Amanda Seyfried, Jennifer Lopez) and Marchesa (Sandra Bullock, Vera Farmiga) were all rising trends. Finally, the evening wasn't all about big wins. The awards help expose more obscure films — shorts, documentaries and foreign-language — to a much larger audience. 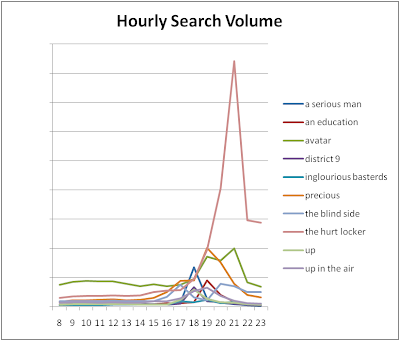 Searches for these titles typically went up tenfold during the evening, and if they took home a gold statue, search volume spiked as much as 100 times higher. Music by Prudence, Logorama, Food, Inc., The Cove and The Secrets in their Eyes all experienced an exponential explosion of queries. People are always eager for more information about the Hollywood stars — personal stats like age, height, family and dating status. During this year’s Oscar® ceremonies, Kathryn Bigelow's height and Miley Cyrus's mother's tattoos were hot topics. Whose girlfriend was most searched for? Easy. George Clooney's (Elisabetta Canalis). So what were the most memorable moments of the broadcast? When George Clooney wandered off the red carpet to greet the crowd, queries on [clooney] shot through the roof. Ben Stiller’s appearance as a Na'vi was another draw, and queries on him were high during his spoof. Molly Ringwald and Matthew Broderick’s John Hughes tribute triggered a flood of nostalgia; Sixteen Candles, The Breakfast Club, Ferris Bueller's Day Off and Home Alone all saw huge query spikes as well. During the memorial portion of the show, queries surged for those in the industry who passed away in the last year, including Ron Silver, Natasha Richardson, Patrick Swayze and Brittany Murphy. On a lighter note, Sandra Bullock set off a frenetic amount of searches when she mentioned a Meryl Streep kiss in her acceptance speech. As we've seen in presidential debates, unusual words also generate great interest. The Oscars led to spikes in searches for [catharsis] (from Robert Downey Jr.'s presentation with Tina Fey) and [spooning] (Colin Farrell talking about Jeremy Renner). We hope you enjoyed the evening, and want to thank everyone for turning to Google search to see the latest. And our parents deserve huge thanks, and our agent... oh, they're telling me to wrap it up...!